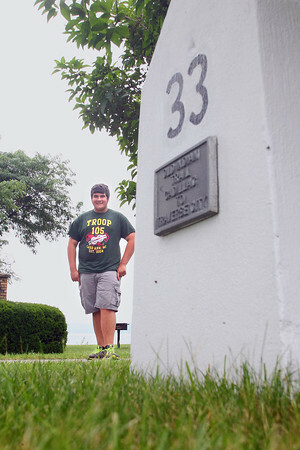 Woody Unruh (cq) of Boy Scout Troop 105 in Lake Ann is repairing and refurbishing the 33 markers on the old Cadillac to Traverse City Indian Trail. The markers, which are typically about 1 to 3 miles apart on the route, were put up in the 1940s in Wexford County and by Grand Traverse County in 1987. Marker No. 1 is near East Lake Mitchell Drive in Cadillac, while Marker No. 33 is at the other end along Grandview Parkway in Traverse City.